These sugar cookies make for perfect one-bowl easy Halloween cookies! All you need are 30 minutes and some black and orange sprinkles or some colored sugar for sprinkling (I suggest colored sugar, keep reading to see why)! The girls are just starting their 2 week long fall break and I cannot believe it’s October already. We are going to be busy running errands and doing all sorts of things around the house during the next 2 weeks. Mad and I have made a list of things we want to bake too. I love it; she’s really turned into quite the baker! We’ve already baked several batches of cookies and a giant loaf of banana bread in the past few weeks! When I asked Mad to pick her favorite recipe we’ve baked lately, she chose these easy Halloween cookies! I can’t say that I blame her! Don’t tell anyone, but this is actually my very favorite recipe for sugar cookies. They taste amazing, but they’re so super duper simple! The cookies are warm, and sweet, and buttery with a perfectly crispy edge. I’m serious, these cookies are to-die-for! Oh and guess what? There’s no rolling or cookie cutters required for this recipe! Just mix (all one on bowl too! ), scoop, sprinkle, and bake! This is a great recipe to do with kids; I put Mad in charge of the stirring and I just added the ingredients in the correct order. Then we scooped them out together and she handled the sprinkles. Since we didn’t flatten the cookies, these little sprinkle balls were rolling everywhere – maybe keep that in mind when you’re selecting your sprinkles. Might I suggest a colored sugar instead? I’m still sweeping up black and orange balls from the kitchen floor…days later! Haha! From start to finish, we whipped up these one-bowl easy halloween cookies in just under 30 minutes (minus cooling time), so they would be perfect for anytime you need homemade cookies and you’re running short on time! We made our cookies 1 TBS size and ended up with 24, but if you used a bigger scoop (say 3 TBS), you could make about 16 really big cookies! These one-bowl easy Halloween cookies could very easily become easy Christmas cookies, easy Valentine’s Day cookies, easy 4th of July cookies…see where I’m going with it? You’ll love them, trust us! Easy Halloween cookies that require no rolling and are ready in 30 minutes! In a medium bowl cream butter and sugar together until smooth. Stir in baking soda, cream of tartar, and sea salt. Add egg, egg yolk, and vanilla extract and mix until combined. Add the flour, half at a time and mix well. Do not over-mix. 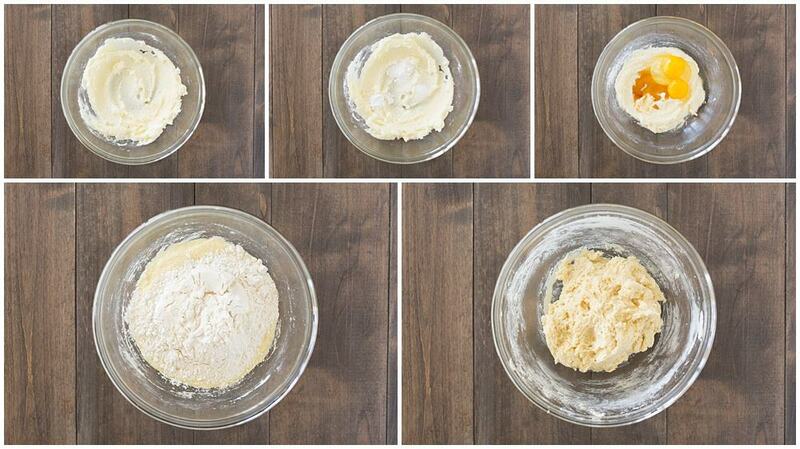 Using a 1 TBS cookie scoop, scoop dough onto prepared baking sheets 2 inches apart. Sprinkle the tops of each cookie with sprinkles. Bake for 12-14 minutes, rotating halfway through until just barely brown around the edges. Let cookies cool completely on the baking sheet. Store in an airtight container for up to 1 week or freeze. « Why A Whole New Blog? Yummm. Reminds me that i need to start working on my holiday cookie recipes. Is summer really over? Love the closeup picture! I don’t make cookies very often, but I might save this to make for ‘snowed in and can’t get out’ cookies haha. Looks yummy! When it comes to cookies, I’m a sucker for sugar cookies. My go to recipe call for them to be chilled overnight, then rolled & cut. Your recipe is a must try. Thanks. I want to reach through the screen and grab some! I love sugar cookies, and these sound fantastic. I love that you’ve been baking with your daughter. Sugar cookies are my go to when I am looking for a quick cookie treat. I’ll definitely give this recipe a try! I love a good sugar cookie — and I love your restraint on decorating them. Just a hint of Halloween sparkle – love them! These are adorable – so simple and sweet, but festive at the same time. Yum!! These are so simple and lovely. I think I would make these ones, where some of those ones I see on Pinterest I’d never make because they’re too difficult. Thanks for the nice and easy! Sounds like your week has been full of baking! Love how soft and delicate these cookies look. And of course the fact that they’re reading in under 30 mins! Those are so sweet and sound like a really good sugar cookie. The colored sprinkles is all you need. Thank you so much Ginny! Besides being totally delicious, they’re quick and easy! Sugar cookies are one of my favourite treats! So perfectly sweet and buttery. Love that these cookies are ready in under 30 minutes too! Mine too Marie! I just love quick and easy. Thank you so much! I love a good sprinkle cookie and these are quick and easy. I love that you could just change up the sprinkles to suit the holiday! These would be super cute for a halloween party but I love that they could really work for any occasion! They look so deliciously chewy! Thank you, Liz! They are super thin and chewy, which I’ve discovered I really love! They’re addicting!